You must know or have ever heard of a company called AMD (Advanced Micro Devices). Inc., ya a semiconductor company's second-largest maker of computer processors in the world after Intel. Products from AMD are microprocessors, motherboard chipsets, embedded processors graphics card (GPU) and processors for servers, workstations and personal computers (PCs), and processor technologies for handheld devices, digital television, automobiles, game consoles, and other embedded systems applications . 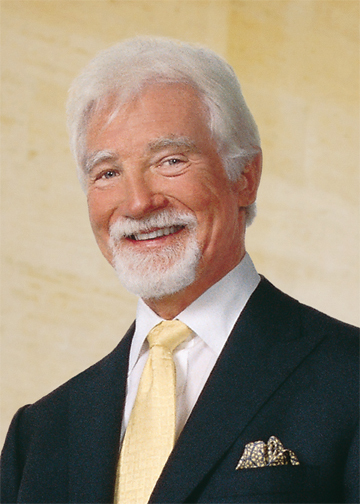 Company founder AMD (Advanced Micro Devices) is Jerry Sanders. He was born with a full name Walter Jeremiah Sanders III was born on September 12, 1936 in Chicago, Illinois, United States. Jerry Sanders III was raised by grandparents from his father. As a boy he had been attacked and beaten by a street gang. He entered the University of Illinois at Urbana-Champaign on a scholarship from the Pullman railroad car company. He graduated with a degree in engineering in 1958. After graduation he worked at Douglas Aircraft Company. He then moved to Motorola, then to Fairchild Semiconductor. He is known as one of the best sellers at Fairchild in the 1960s and is known for her style and compliment. In 1968 Sherman Fairchild brings a new management team in Fairchild Semiconductor, led by C. Lester Hogan, who at the time was vice president of Motorola. Troops from Motorola known as "Hogan's Heroes" is very conservative and soon clashed with the style of a high-spirited Sander. Male graduate of the University of Illinois in 1958 in Electrical Engineerig this, it is also critical thinking. He is not afraid to rumble name Intel processors in the market world. When Intel launched the Pentium processor (Intel 8080). Sanders also desperately fighting for the technology to be able to get it, then when Vinod Dham, the project leader Intel Pentiumnya no small disputes with some Intel, then immediately offered Sanders the man's native India to mengarap processor then named K6. In 1969 a group of engineers Fairchild decided to start a new company, which is Advanced Micro Devices (AMD). They asked Jerrry Sander to join them, and he said he agreed, on condition that he be moved at the company's president. Despite a lot of disagreement in the group, but they agreed and the new company formed by Sanders as President. Sanders running style in his position as CEO of AMD. He remains the company's expert salesman, always present in heavy negotiations and approach them. She likes to visit the office of Los Angeles near Hollywood and stayed at the Hilton Hotel in Beverly Hills. Sanders has always wanted to make money, but he also realized that the key to getting rich is to make people at AMD also get a lot of money too. The more he's rich, he also gave his wealth to the royal to its employees. At the end of the first quarter in which their firms generate $ 1 million, Sanders was standing at the door and give the company a piece of $ 100 to all employees when they leave the office. The whole pegawain the company get stock options, a major innovation at the time. Sanders makes orientation a strong sales and marketing for the company, so the company is quite successful though slightly behind its competitors in technology and production. He splits his company's success with employees, usually to coincide with the achievement of sales targets. One time, when the sales target is reached, the company held a raffle among its employees, and a production worker immigrants in Sunnyvale, California won $ 1000 per month for 20 years (U.S. $ 240,000). He also encouraged the company in difficult times. In 1974, when a severe recession occurred almost made the company bankrupt, but a sales contract with one of the distributors of the company to save the company. Although many of the difficult recession he refused to dismiss workers. Instead of cutting the number of employees, he asked the workers to work Saturdays to produce more and produce new products faster. In 1982, he secured a licensing agreement with Intel which makes AMD a second source for IBM to Intel microprocessors series, a deal that ultimately makes the company the only real competitor to Intel. In 2000, Sanders took the Héctor Ruiz, who at the time was president of the production sector at Motorola, to serve as president and CEO of AMD, and a successor to lead the company at the time retirement Sander. Ruiz replace Sanders as CEO in 2002. The battle between AMD and Intel is in a lot of areas, the most striking difference is in the class of Z-80 (AMD), which is a milestone generation Pentium will entered. At that AMD does tergpgoh hurrying with the launch of Intel processors on a 486 is 586. If from the AMD Z-80 was designed by Federico Faggin, who claims that he makes the processor is superior and has two simple reasons, namely price and performance, when compared to Intel's 586. But the processors are owned by Intel (586), the work of Vinod. AMD announced a merger with ATI Technologies on July 24, 2006. AMD paid $ 4300000000 in cash and 58 million shares of stock for a total of U.S. $ 5.4 billion. The merger was completed on October 25, 2006, and ATI is now part of AMD. It was reported in December 2006 that AMD, along with its main rival in the graphics industry Nvidia, received subpoenas from the Justice Department about possible antitrust violations in the graphics card industry, including the act of fixing prices. In October 2008, AMD announced plans to spin off manufacturing operations in the form of a multibillion-dollar joint venture with Advanced Technology Investment Co., an investment company formed by the government of Abu Dhabi. The new venture is called GlobalFoundries Inc.. This will allow AMD to focus solely on chip design. As long as AMD is also known to be cheaper, and it is also often used to further reap the AMD market. AMD proved to be successful because success for some Asian markets. Apparently it makes Intel "ketar-ketir", so he then poised to make a processor with a cheap price but has a high speed, even though the quality is not as good as it had appeared first.